In the end, AzhwAr says “Those who are well versed in this decad, will become enjoyable for ayarvaRum amarargaL (nithyasUris who do not have any ignorance)”. Subsequently, AzhwAr explains the benefit as “those who can practice this decad will become eternally admired by nithyasUris”. ulagIr – Oh people of this world! sarvESvaran, permeated into contrary entities in many ways as he did during the incarnation as thrivikrama, who has the divine feet, saying “Oh people of this world! 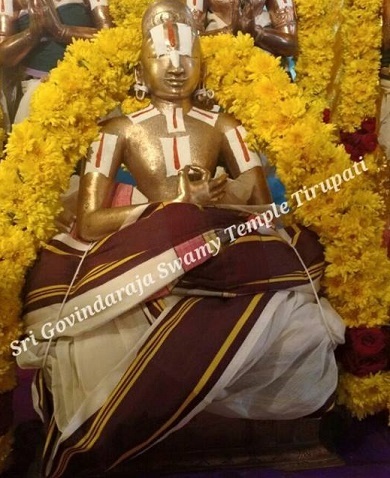 see this”, grew in front of those who are contrary to each other; nammAzhwAr, the leader of AzhwArthirunagari, mercifully spoke this decad for thiruviNNagar among the thousanda pAsurams, in the form of bhagavath AgyA; those who are experts in this decad will always be admired by nithyaSUris without any difficulty. kANmingaL ulagIr enRu kaN mugappE nimirndha thALiNaiyan thannai – thrivikraman emperumAn who is having the divine feet which grew in front of them [people of the world] after having tricked them as a magician since they won’t agree if he said “I am going to place my feet on your head! Come closer!”. kANmingaL – Since they will pull back if he places his divine feet on their heads, he tricked them with the amazing act [of growing tall suddenly]. kurugUrch chatakOpan sonna – This is considered trustworthy since it is spoken by AzhwAr who enjoyed emperumAn‘s saulabhyam [easily approachable]. ANai Ayiraththu – Those who are experts in this decad which explains emperumAn’s orderly conduct of this world. viNNOr – nithyasUris, will admire them forever. There is no kONai – difficulty/shortcoming in it. How is this possible? How come a nithyasamsAri who learns this [and masters it] becomes admirable for nithyasUris who are untouched by the defects of samsAram? Even while being in paramapadham, mukthAthmAs (liberated persons) can meditate on the material realm considering it to be bhagavAn‘s wealth and become blissful. This person who is in this material realm, can experience the same feeling while being in this material realm itself. nithyasUris will eternally glorify such persons thinking “While being in material realm, how can someone have such experience!”. This entry was posted in thiruvAimozhi, thiruvAimozhi 6th centum on November 30, 2017 by Sarathy Thothathri. AzhwAr narrates how emperumAn showed that he is devoted to his followers. He says that not only his form, even his activities are devoted to his followers only. kaLvanE – Oh cunning emperumAn! ninRadhOr pAdham nilam pudhaippa – when nobody had even thought of, a divine foot suddenly hid the entire earth. Or pAdham – AzhwAr is not one who would say things in a mathematical way such ‘as one time one is one’ just as we would when one mentions about one divine foot, we would immediately say that the other divine foot did this. Hence, having mentioned about divine foot, immediately he talks about what the divine shoulder did. nINda thOL senRu aLandhadhu enbar dhisai ellAm – those with knowledge would say that once he obtained the alms he had asked for, his shoulders spread out in all directions and permeated everywhere. They would say that the moment mahAbali poured water on his hand as a symbol of having acceded to vAmana’s request for alms, the shoulders became extremely joyful as if they had got something which they could never get and grew in all directions and measured. enbar – AzhwAr feels distressed that he is listening to this through his ears today, and is not seeing the incident! Where did I get lost on that day! anRu karumANiyAy irandha kaLvanE – Oh one who has the divine form which removes the ennui [of followers], one who wouldn’t go until he obtained what he had asked for in alms, one who made himself as an expert in asking for alms! mANiyAy – wasn’t it the disguise of the great emperumAn! If someone calls the great thirumalai hills as a ‘stone’ wouldn’t his mouth be torn asunder? irandha – when mahAbali was arrogant to claim the worlds of emperumAn as his own, did not emperumAn go to him and ask his own worlds from him as alms! 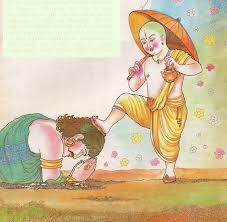 kaLvanE – he showed such a [deceitful] divine form to mahAbali and seized everything from mahAbali. kaLvanE – did he cheat mahAbali? Was it not AzhwAr that he attracted with his beauty! Those who appropriate AthmA, which is actually emperumAn’s, as their own are called AthmApahAris (abductors of AthmA). Since emperumAn abducts such people also, he can be called the AthmApahAri of AthmApahAris (abductor of abductors). However, when he had to take back his possession [from mahAbali], instead of taking it directly, he had to obtain it through alms. The reason for that is …. We shall take up the 62nd pAsuram next. This entry was posted in iraNdAm thiruvandhAdhi, iyaRpA on November 30, 2017 by T N Krishnan. In the tenth pAsuram, AzhwAr says “Know that there is no protection other than his divine feet”. Subsequently, AzhwAr completes his instructions saying “We have as our protection, nothing but the divine feet of sarvESvaran, who is having as his wealth/forms, all movable and immovable entities which are contrary to each other; you analyse and understand”. kANmingaL – you can determine (this) for yourself. emperumAn is the shade which reduces the heat and the sunshine which causes heat; he is having atomic form which is the ultimate state of smallness and universal form which is the ultimate state of largeness; he is having shortness and longness as his qualities; he is all other movable and immovable entities and yet remains unaffected by such qualities; such sarvESvaran is eternally residing in thiruviNNagar which is inhabited by beetles having babyish sounds, due to the enjoyment there; we are not having any protection other than such sarvESvaran’s divine feet; you can determine for yourself. nizhal veyyil – shade which causes coolness and sunshine which causes heat. siRumai perumai – atomic and universal qualities. kuRumai nedumai – shortness and longness which are part of intermediary dimension. maRRumAy – whatever is left out to be said; everything which is not mentioned explicitly. suzhalvana niRpana – animal and plant species. maRRumAy – all other entities which have not been mentioned. avai allanumAy – Has it not been already explained that emperumAn will remain unaffected by the defects of all these entities which are his forms? So, what is being explained here? Here, it says that emperumAn does not have the states of transformations which these entities go through. That is, for the chEthanas (sentient beings), the emotions (joy, sorrow etc) and for the achEthanas (insentient objects), the changes in their forms. mazhalai vAy vaNdu vAzh – Due to their youthful nature, the beetles which are living in thiruviNNagar have very sweet sounds; other than the divine feet of emperumAn who is residing in such thiruviNNagar, we have no protector. 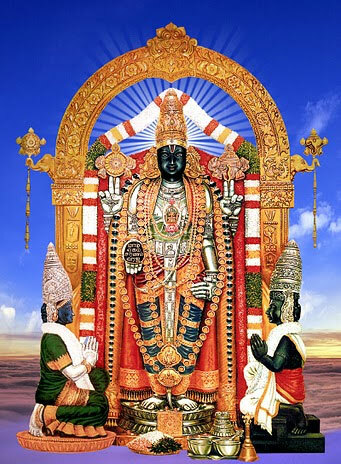 kazhalgaL anRi maRROr kaLaigaN ilam – Instead of saying emperumAn is our refuge, as he himself said in SrI bhagavath gIthA 18.66 “mAm Ekam SaraNam vraja” (surrender unto me only), AzhwAr is saying that the divine feet are his protection [bhagavAn’s devotees, bhAgavathas are said to be the divine feet of emperumAn; so, it can be seen here that AzhwAr is highlighting the devotees as his protection]. kAnmingaLE – This is not exaggeration; you can see for yourself. This entry was posted in thiruvAimozhi, thiruvAimozhi 6th centum on November 29, 2017 by Sarathy Thothathri. Does not AzhwAr, who said this (please refer to the previous pAsuram), know that it is emperumAn’s quality to do at the bidding of his devotees more than aiSvaryam! AzhwAr says that emperumAn will always protect his worlds and that he is very simple in his (AzhwAr’s) matter. Or uruvan allai – you are the one with the form which is independent. While kata upanishath 13 says “nithyO nithyAnAm ” (supreme being has the quality of being permanent and being of the same manner) and chAndhOgya upanishath 6-2-1 says “EkamEva adhvithIyam” (there is only one; there is no second), your form is not the one which is different from everyone/everything else and which controls everyone/everything else. oLi uruvan nin uruvam – it is existing only for the sake of your followers, which is your quality. Just as it is mentioned in jithanthE SlOkam 1-5 “na thE rUpam nachAkArO nAyudhAni na chAspadham, thathApi purushAkArO bhakthAnAm thvam prakASasE” (there is no quality, form, weapon or dwelling place exclusively for you; however, you are having all these qualities only for the sake of your followers) this is your true quality [of existing for your followers]. Your quality is not of the type mentioned in thiruvAimozhi 1-1-1 “uyarvaRa uyarnalam udaiyavan” (one who has auspicious qualities superior to those of everyone else). Rather, it is as mentioned in thiruvAimozhi 1-3-2 “eLivarum iyalvinan” (having simplicity as his nature). You, who are like this …. Ir iruvan enbar irunilaththOr – those who think you have qualities beyond one’s capabilities to measure, are the ignorant ones. They would think that emperumAn, the great supreme being, has only supreme qualities. An alternative meaning for Or uruvan allai is that he does not have the same type of form always. In other words, as mentioned in SrI bhagavath gIthA 4-5 “bahUni mE vyathIthAni janmAni” (many births have passed for me) and in thiruvAimozhi 2-9-5 “piRappil palpiRavip perumAL” (emperumAn who has had many births of his own volition, unlike we chEthanas who were born due to our deeds), he has had many incarnations and divine names. oLi uruvam nin uruvam – even when you were born like that [with many incarnations], your divine form was more and more of Sudhdha sathvam type (pure good state) and with unlimited radiance. Just as it is mentioned in yajur ashtakam 3-6 3-9 “sa u SrEyAn bhavathi jAyamAna:” (he becomes great just by being born), he has the quality as mentioned in these pramANams. Ir uruvan enbar iru nilaththOr – We can construe this as saying that the people of the world say that emperumAn has one divine form as his basic form and another which he takes on whenever he incarnates. Or uruvam – the divine form which is radiant, since he incarnates for the sake of his followers. AdhiyAm vaNNam aRindhAr – the vaishNavas who know that others’ existence is only because of him (emperumAn) who is like this. We shall take up the 61st pAsuram next. This entry was posted in iraNdAm thiruvandhAdhi, iyaRpA on November 29, 2017 by T N Krishnan. In the ninth pAsuram, AzhwAr says “While I rejected him, emperumAn forcefully gave the shadow of his divine feet, to remove all my fatigue”. emperumAn being distinguished for me, being my father who is the cause for my sustenance, being my step mother, who is having the femininity which is opposite to such masculinity, being my distinguished, real mother who is unlike the step mother who just raises the child, manifesting his attractive nature which resembles gold, manifesting his radiant nature resembling a precious gem, manifesting the coolness resembling a pearl, being the benefactor for me, is living in thiruviNNagar which is surrounded by shining golden fort; being the lord of all there, having no match for him, the great benefactor mercifully bestowed me the shadow of his divine feet. en appan enakkAy – Being a distinguished lord for me, and the father who is the cause for my sustenance. That is, unlike a father who would sell his child during famine to survive, emperumAn is a father who would protect me even at the cost of transforming himself and losing his identification. iguL Ay – iguLai is a way of addressing a friend. It is indicated as “iguL” here. This implies – being my friend with whom I can have discussions. ennaip peRRavaL Ay – Unlike the step mother who will just raise the child, you are being a mother who carries the child for ten months, caring for it and delivering it. pon appan … – There are some entities which remain the benefactor, but will lead to other enjoyable aspects [like gold, gems, pearls]; emperumAn favoured me so that he himself remains as all such enjoyable aspects. minnap pon … – The benefactor who lives in thiruviNNagar which is surrounded by a shining golden fort. than oppAr il appan – The great benefactor who has no match when it comes to favouring certain things to others. nanjIyar mercifully gives an explanation to this – when he rigorously pursued me in thiruvAimozhi 6.2 “minnidai madavAr“, I pushed him away saying “I don’t want you”; at that time he gave himself saying “Do you know what is good for you? You really need me”. thandhanan thana thAL nizhalE – I tried to move away from him saying “I will be alright even with the heat of sunshine, staying away from you”, as said in “azhiththAy un thiruvadiyAl” (destroyed with your divine feet), he eliminated my ego with your divine feet, and bestowed the shadow of his divine feet to me. As soon as being touched by the divine feet, one would give up the objects which he considered as his. This entry was posted in thiruvAimozhi, thiruvAimozhi 6th centum on November 28, 2017 by Sarathy Thothathri. AzhwAr mentions about the first time that he received the grace from emperumAn which was the cause for his benefits such as these. arul purindha sindhai – as mentioned in SrI bhagavath gIthA 16-19 “thAnaham dhvishatha: krUrAn samsArEshu narAdhamAn kshipAmi ajasram aSubAn AsurIshvEva yOnishu” (I push those who hate me, those who are cruel, those who are the lowliest among humans and those who have inauspicious qualities, always into samsAram (materialistic realm) and that too in the clan of demons), instead of pushing me into such a clan, he showers his grace on me through his divine mind as said in SrI bhagavath gIthA 10-10 “dhadhAmi bhudhdhiyOgam tham yEna mAmupayANthi thE” (I give them intelligence with which they can reach me). aruL purindha sindhai – he has such a divine mind that he cannot sustain himself without showering grace. This implies that the faults present in the chEthanas are hidden from him by his grace. adiyAr mEl vaiththu – he showers such grace on his followers like us. Showering his grace without looking at anything other than the criterion that we are his followers. Here, the term adiyAr (followers) can be construed to refer to followers in general or to the AzhwAr who was standing in the corridor [of mrigaNdu maharishi in thirukkOvalUr] along with the other two AzhwArs when emperumAn started crowding around them with his consort [he could be referring to the first three AzhwArs as adiyAr]. adiyAr mEl vaiththu – emperumAn cannot exist without showering his grace on his followers. Hence, he showers the grace so that he does not lose himself; AzhwAr terms this as causeless mercy. poruL therindhu kANguRRa appOdhu – at that point of time when he showered his grace on us, so that we would know things as they are. Alternatively, this can be construed as: that point of time when emperumAn considered them too as entities and showered his grace. nammAzhwAr too has mercifully stated in thiruvAimozhi 5-7-3 “poruL allAdha ennaip poruLAkki adimai koNdAy” (you recognised me as a sentient entity when I was lying as an insentient being and made me a servitor). Since he became qualified to receive his grace …..
iruL thirindhu nOkkinEn – I found that I lost my ignorance which was a hurdle for me to get knowledge. Once I saw this …. ninaindhEn adhoN kamalam – I thought of your divine feet which are like lotus flower. I realised that I have to attain only your divine feet. I ascertained that this is my goal. Orndhu – analysing that I, who am subservient to emperumAn, have no connection with myself and that I am the possession of emperumAn. Feeling sad that he had mistaken emperumAn’s possession (the soul) as his own. ennaiyum angu OkkinEn – I submitted myself to his divine feet. I ascertained that he is the means [to attain him]. We shall take up the 60th pAsuram next. This entry was posted in iraNdAm thiruvandhAdhi, iyaRpA on November 28, 2017 by T N Krishnan. In the eighth pAsuram, AzhwAr says “thiruviNNagar emperumAn is not just my refuge but everything”. Subsequently, AzhwAr says “krishNa, who is sarvESvaran and [yet] humble towards his devotees, who has certain aspects for both favourable and unfavourable ones, is the distinguished refuge for me”. en saraN en kaNNan ennai AL udai ennappanE! emperumAn is the indestructible refuge for dhEvas and cruel death for asuras; he is placing and not placing the worldly humans who are classified in this manner, in the shadow of his divine feet; such sarvESvaran, who has descended into thiruviNNagar which is the refuge for the southern direction, accepted me as krishNa and accepted my service as my lord; he is the natural refuge for me. 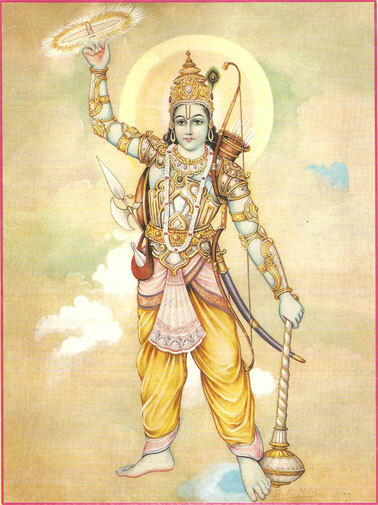 van saraN surarkku Ay – Being the strong protector for dhEvas, by himself accepting the arrows shot at them. asurarkku vem kURRamum Ay – For the demoniac people, he is the cruel death personified as said in “anthakan thaNNIr” (yama (deity for death) is cool, implying that he is more cruel than death itself). than saraN … – Having the favourable ones such as arjuna et al in the shadow of his divine feet, and pushing away the unfavourable ones such as dhuryOdhana et al, though they have the same relationship with him. then saraN thisaikku – As said in SrI rAmAyaNam AraNya kANdam 11.82 “dhakshiNA dhik kruthAyEna SaraNyA puNya karmaNA” (The southern direction which was made as a [sacred] abode, by that sage agasthya who has an auspicious/virtuous history), the benefactor who descended to thiruviNNagar, which is considered as the refuge for the southern direction. en saraN – my refuge. 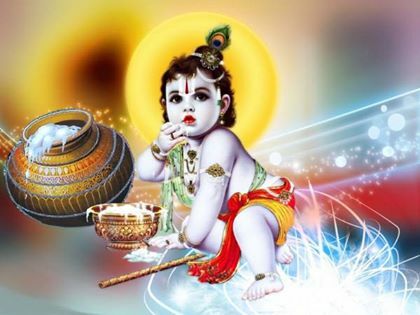 en kaNNan – krishNa who is humble towards me. en appan – my benefactor. ulagam (world) indicates “the elders and the learned persons” who live there. This entry was posted in thiruvAimozhi, thiruvAimozhi 6th centum on November 27, 2017 by Sarathy Thothathri. AzhwAr says that he got all these benefits through the mercy of emperumAn. nAm peRRa nanmaiyum nAmangai nannenjaththu Ombiyirundhu emmai Odhuviththu – it is my great benefit that saraswathi thought that my tongue is proper( place) for singing about emperumAn and making me to praise him. Odhuviththu – teaching me in my way. Just like teaching princes without hurting them, making me to sing about emperumAn. 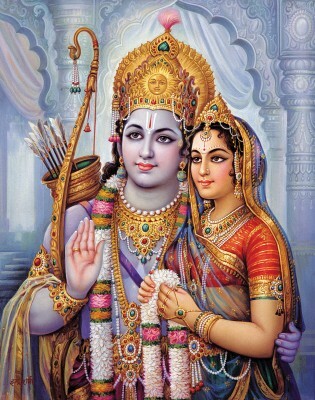 vAlmIki bhagavAn composed SrI rAmAyaNam due to the grace of brahmA. AzhwAr was graced by emperumAn. How did he shower his mercy on AzhwAr? vEmbin poruL nIrmaiyAyinum ponnAzhi pAdu enRu – you are seeing the beautiful divine disc in the divine hand of emperumAn! Its beauty is very sweet. Even if it appears to be bitter to you like the bitterness of nIm leaves, do not stop singing about him. ponnAzhi pAdu enRu – is the matter to be sung about [emperumAn] like the taste of nIm leaves? What is the reason for his showing partiality towards us? aruL nIrmai thandha aruL – the reason for our getting the benefit of singing about him is the grace which he, who has grace as his nature, showered on us, says the AzhwAr. nAmangai Odhuviththu – this implies that saraswathi supported AzhwAr in his singing about emperumAn. nammAzhwAr too has mercifully mentioned in thiruvAimozhi 1-10-11 “soRpaNi sey Ayiram ” (among the thousand songs in which he carried out kainkaryam to emperumAn through the faculty of speech). Hasn’t it been mercifully stated in SrIsthavam 11 “lOkE vanaspathi:” that saraswathi is a devotee of pirAtti (SrI mahAlakshmi)! We shall take up the 59th pAsuram next. This entry was posted in Other on November 27, 2017 by T N Krishnan. In the seventh pAsuram, AzhwAr says “Even for the greatest persons, there is no other firm refuge than him”. Subsequently, AzhwAr says “The divine feet of sarvESvaran who has distinct forms for his devotees and others, are the popular refuge for everyone”. emperumAn is having a divine form which is enjoyed by his devotees and a form of this material universe, which are shining and not shining, firm and uncertain; such emperumAn descended to be bowed down by brahmA rudhra et al with their heads in thiruviNNagar; for every sentient being, there is no other refuge than such emperumAn’s very strong, divine feet, which are having the greatness of not having any thing equal or greater. param sudar udambAy – Having distinguished, divine form which is made of sudhdha sathvam (pure goodness). 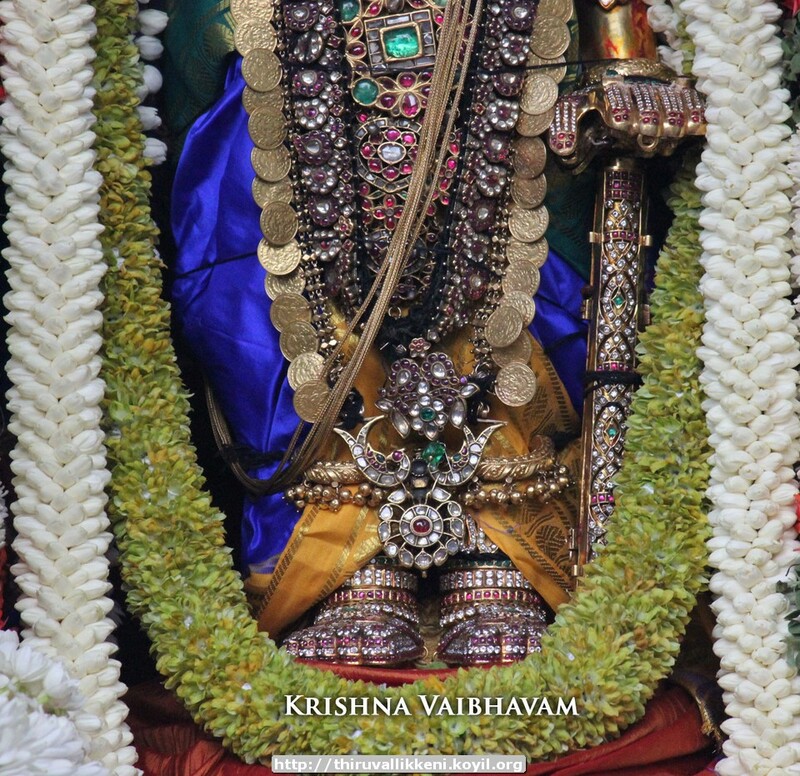 SrIvishNu purANam 1.9.67 “thEjasAm rASimUrjitham” (collection of radiance). azhukkup padhiththa udambAy – Having the material realm which is bound by the three qualities (sathvam (goodness), rajas (passion) and thamas (ignorance)), as his body. karandhum – Though he is present as antharAthmA (in-dwelling super soul) for the material realm, he is protecting them, being unnoticed by them as said in bruhadhAraNyaka upanishath “yamAthmA na vEdha” (The AthmA who is unaware of paramAthmA). thOnRiyum – To be seen by those who remain as said in thiruvAimozhi 8.5.2 “kANa vArAy enRu enRu kaNNum vAyum thuvarndhu” (those who have their eyes and mouth dried up, pleading for emperumAn‘s arrival to see them), incarnating as SrI rAma, krishNa et al. ninRum – remaining for hundred years, ten thousand years etc during such incarnations. kaidhavangaL seydhum – Engaging in mischief. That is, while having incarnated, not making SisupAla et al realise his divinity and to let his devotees realise his divinity. viNNOr … – The benefactor who is standing in thiruviNNagar who is bowed down upon by brahmA et al thinking “we have fulfilled the purpose of having head”. varam koL pAdham allAl illai – the great divine feet which can be approached by even the most inferior persons. yAvarkkum … – Even for the greatest of the greats, there is no stronger refuge than those divine feet. All saviours other than emperumAn, will drown along with the bound soul; other than emperumAn’s divine feet, there is no stronger refuge. Only those who take shelter of his divine feet, will survive. This entry was posted in thiruvAimozhi, thiruvAimozhi 6th centum on November 26, 2017 by Sarathy Thothathri. AzhwAr says that emperumAn, who is united with pirAtti, is the one to be attained by all. kEttIrE – did you listen? 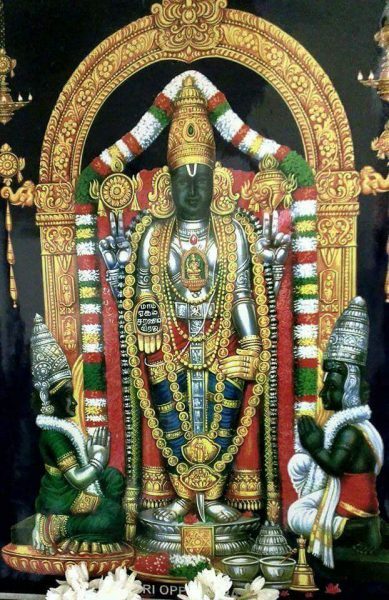 thirumangai ninRu aruLum dheyvam – emperumAn, in whose divine chest periya pirAtti is dwelling permanently, as mentioned in thiruvAimozhi 6-10-10 “agalagillEn iRaiyum enRu” (I will not leave this place even for a moment) and blessing [devotees]. pirAtti is the identification for emperumAn, never leaving him. SrI rangarAja sthavam 1-9 says “lakshmIpadhalAkshaika lakshaNam” (emperumAn has the footmarks of pirAtti’s divine feet as his identification). Only he, who has the marks of pirAtti’s decorative designs on her divine feet, is the supreme lord. This identification is not coming out of his deeds such as creating the world etc. thirumazhisai AzhwAr has mercifully mentioned in his nAnmugan thiruvandhAdhi 53 “thiruvillAth thEvarai thERElmin thEvu” (don’t consider as Lord, one, who is not associated with pirAtti). At the beginning of gIthA bAshyam [a commentary on SrI bhagavath gIthA by swAmy rAmAnujar] it is said “Sriya: pathi nikhilahEyaprathyanIka kalyANaikathAna:” (one who is the consort of pirAtti, being the opposite of all faults and having all the auspicious qualities). Even before saying that he has auspicious qualities, since it is mentioned that he is the consort of SrI mahAlakshmi, this becomes his unique identification. kadaippidimin kaNdIr – instead of thinking “I am saying something”, keep this in your heart firmly. kadaippidimin kaNdIr – be fully focussed on this. For people like us, without any qualification, is it possible to praise like this? urimaiyAl EththinOm – did I praise him in some other method? Did I not worship him because he is my Lord! Hence, for you people also, there is no shortcoming in praising his divine feet. endhai pEr nAm urimaiyAl EththinOm – we praised his divine names because we are his followers. We, who know our relationship with him, praised him without trespassing that. We attained him with the blessings of pirAtti, just like lakshmaNa and vibhIshaNa attained him. We did not try to attain him directly, just like sUrpaNakA did, by breaking the method. 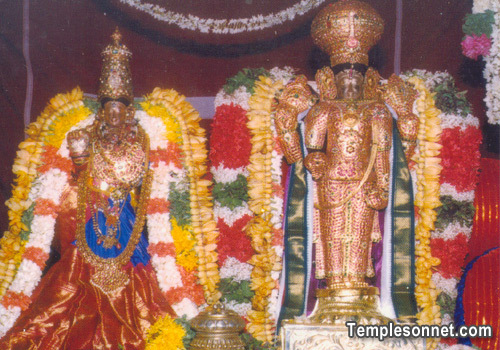 irum thadakkai endhai pEr – we praised the divine feet of emperumAn who has two huge, well grown shoulders. We shall go on to the 58th pAsuram next. This entry was posted in iraNdAm thiruvandhAdhi, iyaRpA on November 26, 2017 by T N Krishnan.